This post is was originally published on my group blog, Quirk & Quill. I don't usually write to music. It distracts me, but I do write with it. I have favorite music for getting into moods, connecting with characters, or inspiring story. I credit my songwriter friend, John Elliott, and his music for inspiring this post. I've written with his music many times, and his new indie album Good Goodbyes released Tuesday. When John invited me to write a review of his album, I told him I don't know anything about reviewing music. I do know I love this album, that it's evocative and inspiring, and I'm excited to try writing with it soon. Here are some ideas for writing with music, even if you're not fond of playing it while you write. Make playlists for a range of emotions and tones that you can listen to before diving into scenes. If you don't want to invest time in creating your own playlist, choose one song and see what playlist iTunes Genius or Pandora or a similar service creates for you. Make a Pandora radio station for a character. Input a few of the character's favorite songs and discover other songs they might like. Sometimes, the lyrics of songs discovered this way have led me to theme and story in surprising ways. Choose a song lyric as a thematic touchstone. Paste the quotation at the top of your manuscript, whether or not you intend to quote it in the finished book. Once you have a rough outline, find a song to represent each point on it. Listen to the songs together as a soundtrack and see if you learn anything new about your story. Listen to a song with evocative lyrics and jot down the lines that stand out to you. See what happens if you try to write a story around those lines. Find a song or music video that inspires you. Songs and music videos are so often like poetry, containing signposts of story but open to interpretation. Your own interpretation might become an original plot. Two music vids that always inspire me are Beirut's "Postcards from Italy" and the Raveonettes "Dead Sound." The latter has majorly helped me get into the mood for my current WIP. If you're up for a kick-in-the-pants, do-it-right-now challenge, try the one of the last two exercises with this video of John Elliott's "Back Where I Was" set to a single thunderstorm. I recommend making the video full screen. Share a bit of your exercise or let us know how it worked for you in comments! You can hear samples of tracks from more of John's work and see more videos of his songs here. This was originally posted on Quirk & Quill. Heat causes expansion. Cold, contraction. Fire behind a story gives it flesh. We find our spark. The story burns. The pages fill. And once the story's full, it's time for cold. Sharp. Reflection. In my first revision of DON'T TOUCH for my editors, I had a lot of questions to answer, lots of backstory to clarify, characters to unfold. The novel grew. When I sat down with my line-edits, I needed to focus on pace. I needed to chill out, get analytical, and SLASH with an ICY BLADE. I wanted to see how all the characters, settings, and threads fit together, so I looked to the blog of fellow VCFA grad Ingrid Sundberg. She has many excellent posts on structure, but since my book deals with OCD, it's only fitting that a post called "Obsessed wtih Story Structure" spoke to me. I love that this post encourages flexibility in design. This is not a formula. Identifying what needs tracking for a particular story can be as instructive as creating the visual itself. I made a graph tracking four settings, five plot threads, two types of scenes (flashbacks and theater scenes), and nine characters. Along the top, I also used opposing colors for alternating sections and chapters (shown in the second picture). 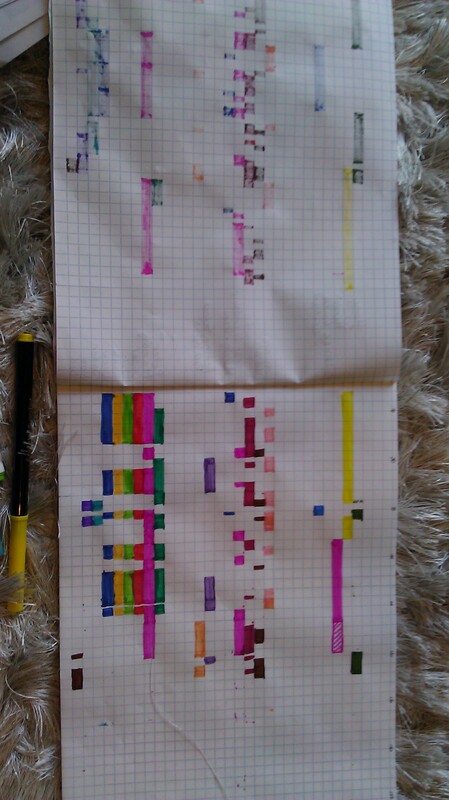 On a separate track, I outlined all the plot points and played with lines representing tension and desire. Then as I cut, I folded over the cut pages, accordion-style. As the graph contracted, the proportions began to look nicer, and the patterns pleased me. For other sections, I was able to visualize changes without manipulating the paper. It helped me identify sections that needed trimming or a change of pace. If you're considering trying this, here are some things I learned. I got super-specific -- one block on my graph equals two pages. I would suggest starting on a larger scale. The trends and proportions should still be clear, but it won't be as painstaking. I might also start with less characters or group those who almost always appear together. For me, mapping out the plot threads was most helpful. If I had a page or more with no plot threads represented, often, it could be cut. 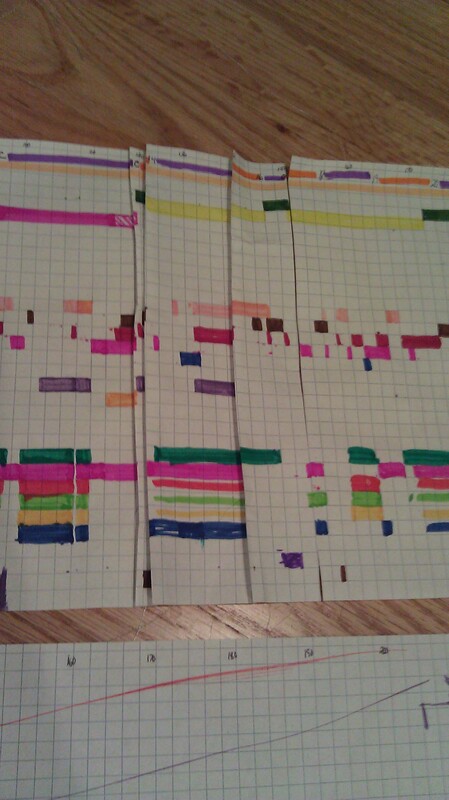 I also found it helpful to use a single color for both a character and a plot thread that featured him or her. In my graph, the hot pink color represents Caddie's friend Mandy, the thread of their friendship, and the setting of Mandy's house, and that consistency made it easier to connect the sections of the graph. Best of all, this graph gave me the courage to SLASH without worrying about what might be lost.